Let me start by saying that I, myself, have bought the “How To Make Webcomics” book, and it’s awesome. Love it, just love it. Love, love. However I noticed quite a large number of typos – nothing that I would say devalues it or anything. It’s really hard to proof read, trust me. I know. 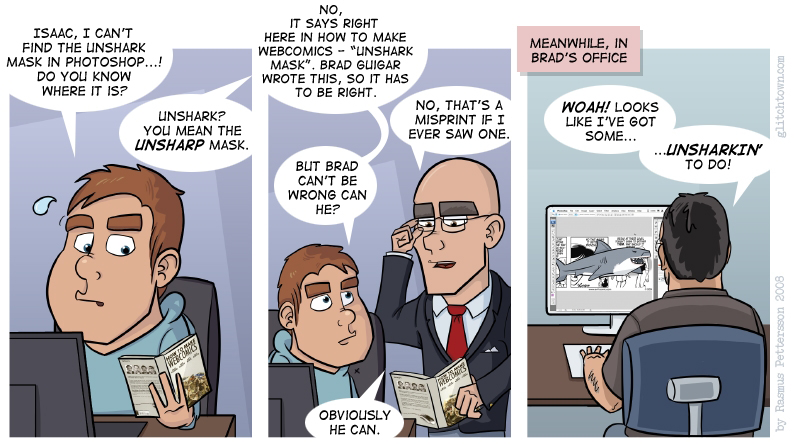 But, there was one typo I found particularly amusing – Brad Guigar wrote “unshark mask” instead of “unsharp mask”, on page 50. I couldn’t resist, so I made this strip. And I figured Leslie and Isaac of course also has gotten the book, since there trying so hard to fit in in the web comic society. So Brad, if you’re reading this (yeah, right… ._.) – I’m just kidding around, but I think you know that already. No harm done. I like the art in this one, tried a new thing with the backgrounds. Look’s good, amirite? This entry was posted on Monday, May 5th, 2008 at 3:23 pm and is filed under Comic. You can follow any responses to this entry through the RSS 2.0 feed. Both comments and pings are currently closed. I did not find the typo. Where is it on page 50? I searched all over, I did! It was in the text under the image, if I recall right, but I’m sure they’ve changed it in the newer versions. Yes, now that I look I see they must have changed it.